I think war is so inhumane, yet so “human” at the same time. Humans have always had a hankering for going to war. At the end of the day, it all comes down to greed. The aggressors desire what someone else has, or want more of what they already have: territory, power, women, men, weapons, money, oil, gold, and other resources. I could imagine that the list is much longer than this, but for the sake of simplification, war is an action taken to claim things that none of us have true ownership over anyway. That being said, I have always been interested in learning about wars. I do not condone fighting ever. I am a totally peace-loving person, but I do enjoying learning about the human experience. 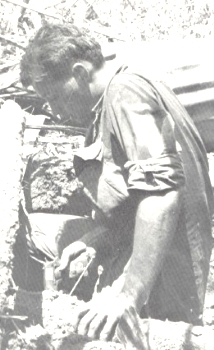 So, I wanted to share this slideshow that I found about the Vietnam War‘s Cu-Chi tunnels. CLICK HERE TO SEE THE SLIDESHOW RIGHT NOW. Don’t forget to come back and finish reading, k? Formerly known as Saigon, Ho Chi Minh City has preserved many remnants from the war. The Cu Chi Tunnels is a museum that is open to tourists that features some of these preservations. Visitors can tour the safe areas of the tunnels, see artifacts from the war, and even shoot similar weapons at the end of the tour. The Cu-Chi tunnels were built to hide and shelter Viet Cong soldiers and Vietnamese citizens during the Vietnam War (1945-1975). The USA joined the war around 1950 by providing $15 million to France, but did not physically land in Vietnam until 1965. CLICK HERE for the best timeline I could dig up. 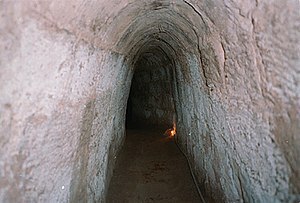 The tunnel openings and hallways were built small enough to accommodate the size of the average Vietnamese people, but were an uncomfortable tight fit for the typical Westerner. The tunnels were extremely deep in some areas. There were areas that were used for hospitals, weapon and food storage, dining, living, sleeping, kitchens, and command centers. These tunnels were the bane of existence for opposing troops. They were riddled with fatal booby traps. False floors would open to punji-stake traps, where intruders would meet a horrible fate if they fell in, usually dying from being impaled with large stakes and dropping into holes that were impossible to get out of. The tunnels weren’t a picnic for the Vietnamese either though, almost half of the inhabitants suffered from malaria, illness, and intestinal parasites. Of course, since it was made within the ground, there were spiders, ants, poisonous centipedes, scorpions, and whatever else kind of creeEEeepy crawlers. (If you were a child of the 90s, you actually sang the word “creepy” and now it’s stuck in your head). There was also a lack of clean air, water, and food. If the citizens had a hard time, you could only imagine how difficult it was for the opposing soldiers who knew very little about the tactics. These tunnels were a huge factor in making the war more difficult for the opposing soldiers and prolonging the war. Not that the US likes to admit to failure, but we basically lost this war. Instead we use phrases like “we withdrew from the war”, so that we can still be proud Americans. Being on their turf gave them a significant advantage. Our “advanced” technologies, were no match for their technology. I’m sure that at first glance it seemed very primitive, but in actuality, it was very advanced, successful, and deadly. You will see what I mean by the photos below. If I could, I would copy-paste all of the photos here, but that function was blocked. Sorry! As a consolation prize, CLICK HERE, to go to the site and flip through the slideshow. It’s so amazingly innovative and creepy at the same time. Below are some photos that I was able to scrounge up. This image is graphic. It is a black and white photo that shows how a punji-stake trap killed soldiers. I think its of a soldier that fell victim. If you are kind of squeamish, do not CLICK HERE. This travel blog photo’s source is TravelPod page: Good morning, Vietnam! This booby trap would lay straight and then flip as unsuspecting soldiers took a careless step on to it. Ouch! Opening to a tunnel. That guy’s foot can barely fit inside! Booby traps like these would be hidden beneath false floors. Soldiers would usually meet a brutal death. A really old photo of a man squeezing through the tunnel and avoiding a hole. You do NOT want to go in there. Do not play hide and go seek with this guy. Im feeling claustrophobic just from looking. « Are you a wayseer? Hi mates, its impressive article concerning tutoringand completely explained, keep it up all the time. Hi there, You have performed a fantastic job. I’ll certainly digg it and personally recommend to my friends. I am sure they will be benefited from this site.